The Garima Gospels are also the subject of an exhibition at the Classics Center at the University of Oxford which runs through December 18, 2016. Read more about the importance of the Garima Gospels in The Telegraph (UK). 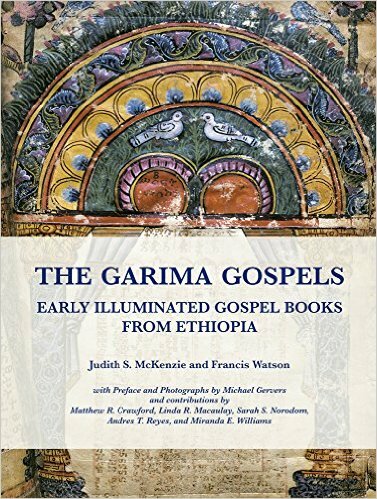 The group of early Christian illuminated manuscripts known as the Garima Gospels — written in an old Ethiopic translation of the Bible — are among the very earliest and most important illustrated Christian books. They have never been published in a properly illustrated edition before, nor with a sound scholarly introduction and discussion such as presented here. Judith McKenzie and Francis Watson’s remarkable publication of Michael Gervers’ photographs is not only the first fundamental presentation of this immensely important set of visual and textual materials, but it is also a record of the state of the manuscript at the moment of its discovery by contemporary scholarship. The volume is a landmark in early Christian studies and in late antique art history. How many movable objects have been in use ever since late Antiquity, in the same place they were produced? The battered and well-thumbed Garima Gospels may never have left the sequestered Ethiopian monastery where they still reside – and which no woman may enter. The English artist Beatrice Playne first noticed them in 1948 (they were carried out for her to inspect). She perceptively compared them with the Syriac Rabbula Gospels of 586 in Florence. Now Judith McKenzie has taken the lead in publishing and discussing all the illustrated folios for the first time, while Francis Watson’s analysis of the canon tables drives home the point that images should not be studied in isolation from the texts they adorn. This attractive and learned book will at last ignite informed debate about one of the most important manuscripts to have survived from Antiquity.